The coastal collection is the ideal way to bring the seaside to your home. With its calming and muted tones along with earthy and rustic textures, it is a great way to get in the holiday mood from the comfort of your sofa. This collection is great for all of you creative types out there, whether you are looking for a new accessory or for a main attraction; this collection gives you the opportunity to do it all. It is full of quirky and unusual designs and textures, from the ball fringe to the tie bands and tiebacks, we have all the materials for you to transform any room and give it that maritime feeling. Nautical themes are timeless and a often a great way to open up a room, with light and airy colours and earthy textures, you really can bring the outdoor in, and with summer just around the corner, now is a perfect time to do so. At Jones we pride ourselves on having the on trend products that will last a lifetime. Our coastal collection provides just that, with beautiful textures and neutral colours they can go with anything, anywhere, even if nautical themes aren’t for you, they can add a rustic element to any surrounding or bring a touch of nature to a modern space. The range offers a variety of different products to suit your every need, with tiebacks and tiebands to decorate your windows and fringes and braids to enhance your accessories, this range has everything you will need to transform an everyday room in to a seaside escape. The coastal range comes in four colours; Cotton, Jute, Natural Linen and StoneLinen, these are very muted earthy colours which compliment the rope textures in the material. The colours in this range offer natural and soft tones, the perfect compliment for bold colours often used with nautical themes. The subtle hues of the cotton to the jute means not everything needs to be in plain, simple colours. The ball fringe is a quirky accessory; with small woven balls along the trim it can be a fun element to a cushion or curtain. 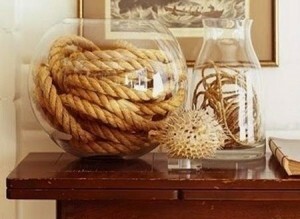 The balls are tightly woven in a rope effect and really compliment the rustic coastal themes in this range. The ball fringe offers a softer approach, with small fleece like balls along the bottom of the trim. We have three tiebacks in this range, each with their own look and feel to them,offering a varied choice. The Padstow tieback, this is the more traditional one in the range, with its characteristic tassel and embrace, but still in keeping with the range the tassel incorporates the rope effect reflecting the nautical themes. The Shanklin tieband, this is an unusual tie band, as it doesn’t conform to the normal shaping or patterns of traditional products. This one is extremely true of the range, the knots are reflective of the maritime theme and the colours compliment it extremely well. The Falmouth tieband offers a very simplistic look for this range, its smooth winding rope would go perfect with any surrounding, with the colours offering soft notes. We have a brand new presenter card for this range that gives you the opportunity to see the collection for yourself; It includes every products in the range, with samples of the trims and braid so you can get an idea of the colours and textures, images of the tiebacks are also available. 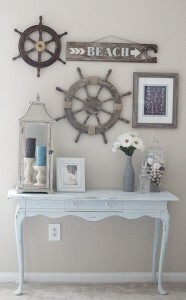 Need some inspiration on how to get the perfect nautical themed room? We’ve got all the inspiration you’ll need over on our Pinterest page!